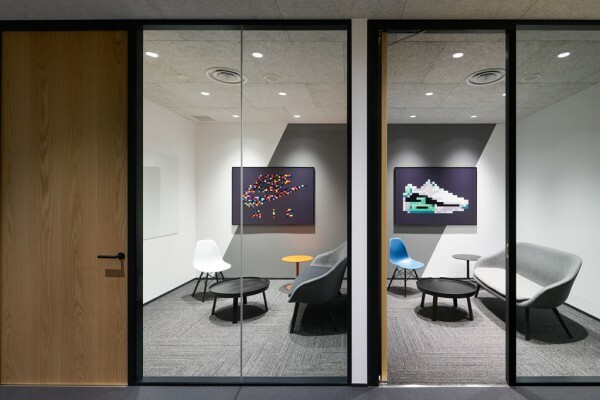 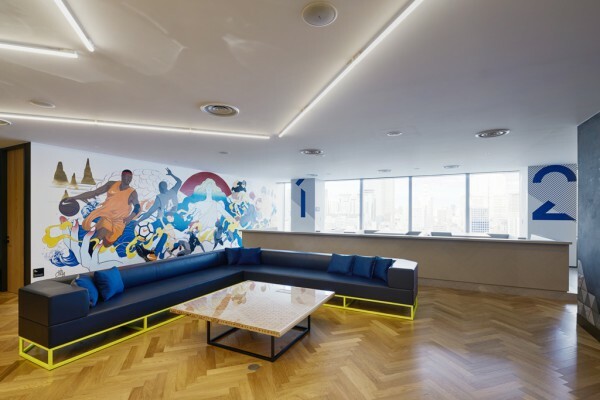 We designed the new office of a sports brand company which relocated in Roppongi's Tokyo Midtown. 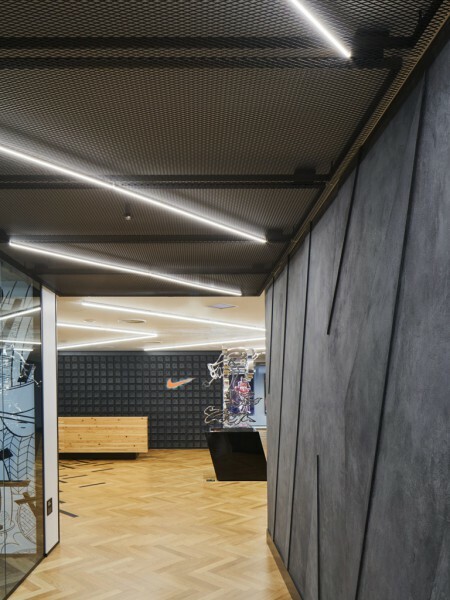 Previously dispersed around the city, the corporation's functions, such as offices, showroom, etc., were consolidated under the same roof over an area of 6,400m2 on two floors. 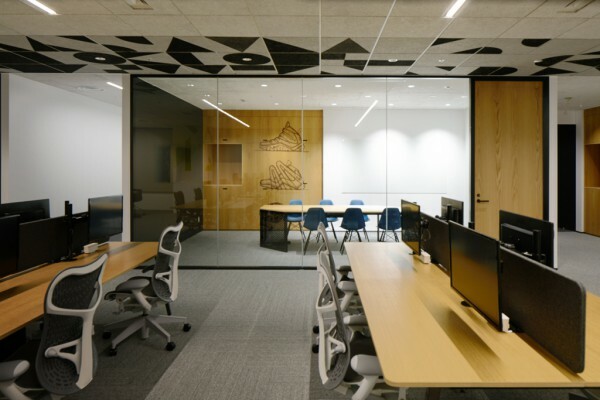 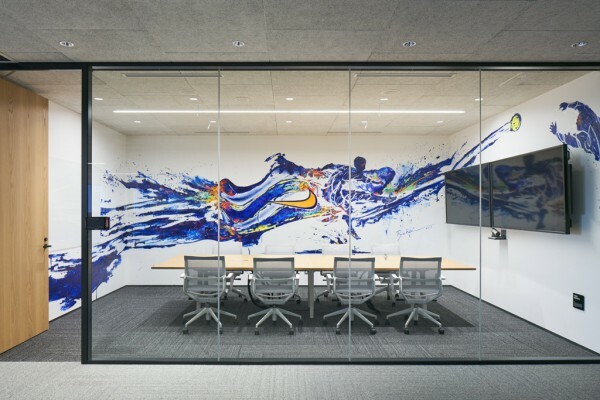 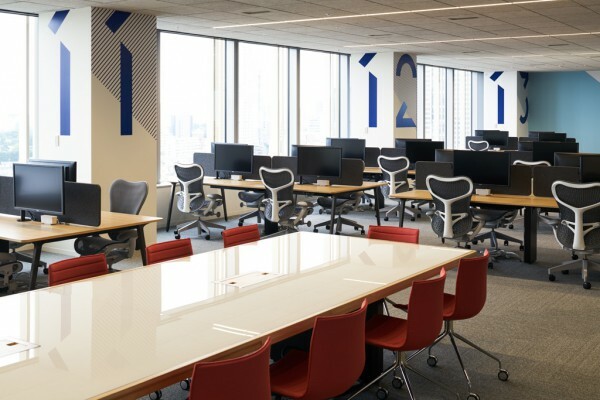 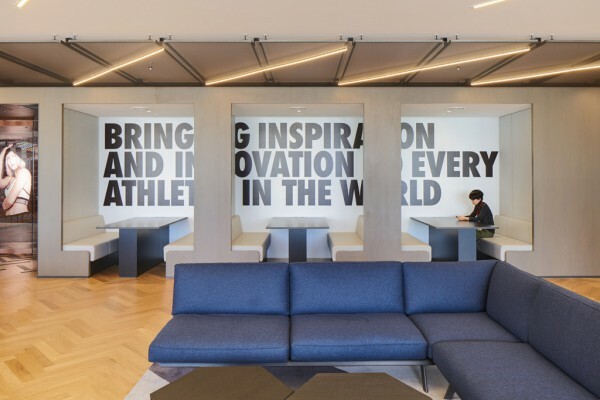 Deliverables included branded offices designed in collaboration with the company's U.S. headquarters design team to implement an overhaul of their employees' working methods. 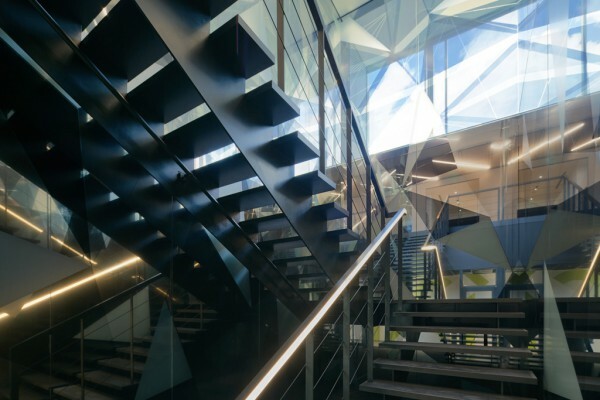 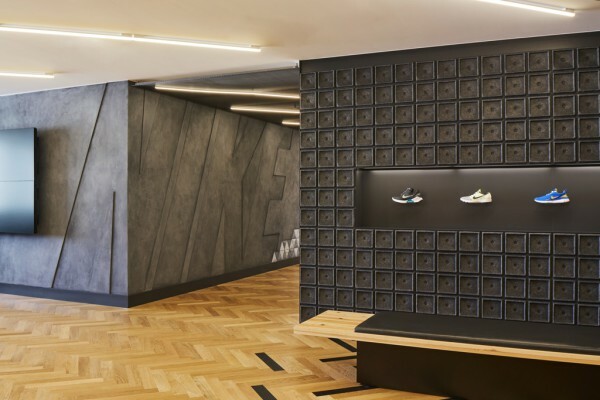 The upper level consists mainly of guest spaces, such as the entrance, a hub and a showroom, while the remainder of the floor and the entire lower level are made up of work spaces. 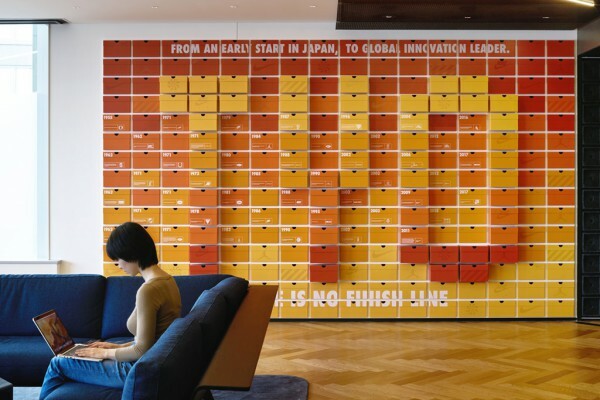 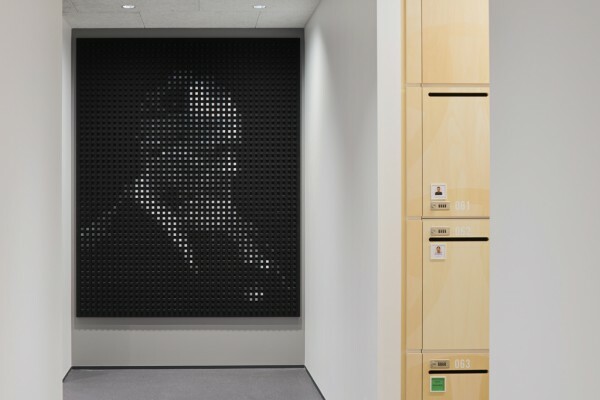 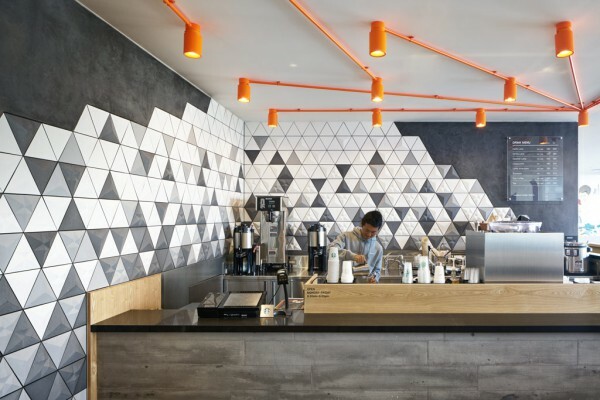 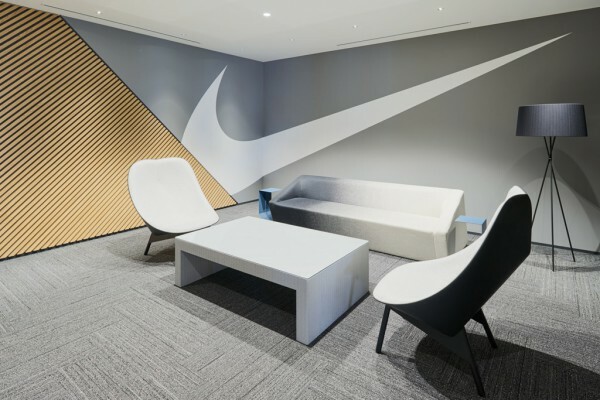 Branding-inspired design elements can be found at every turn, including original artwork, the "STATION 7" café, named after the 7th station of Mount Fuji visited by the founder, and a corporate history wall made using shoe boxes. 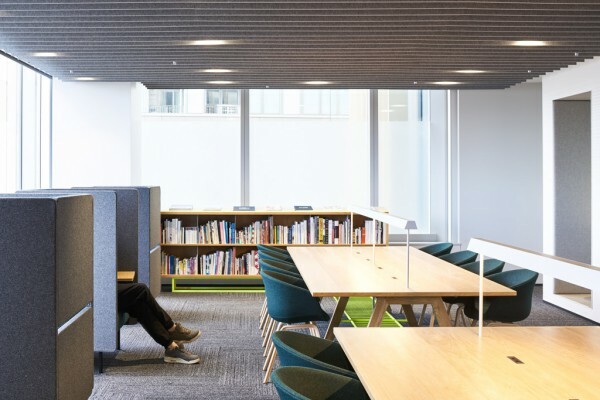 Utilities and individual offices are concentrated on the core-side of the work space whereas unassigned desks are found along the window-side area. 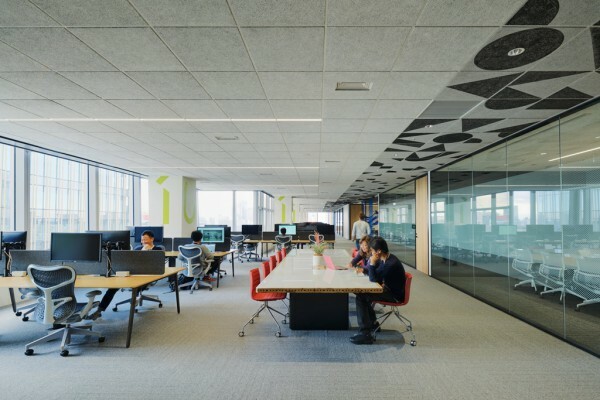 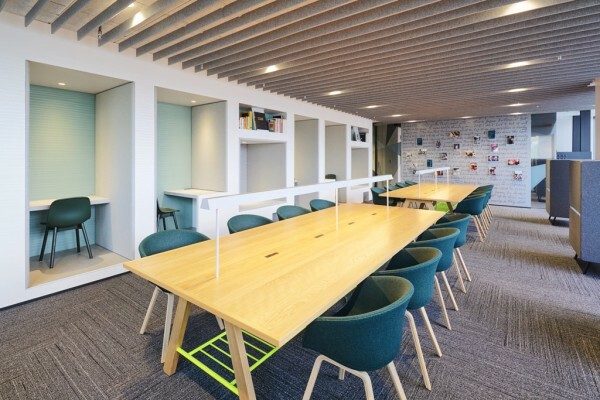 In this open office area is a space known as "Team Home" which can be used by departments individually or collectively according to each project. 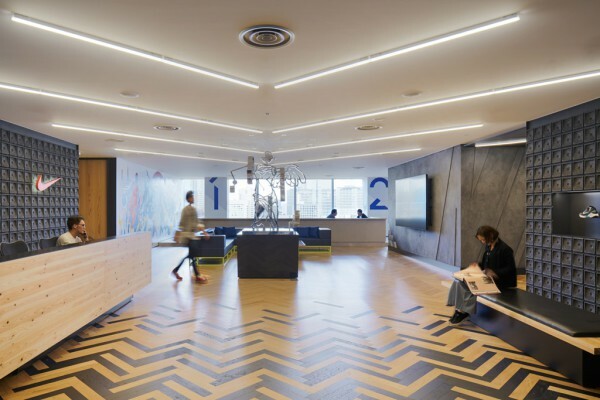 The management of this space is at the core of the company's work style called "Free Style". 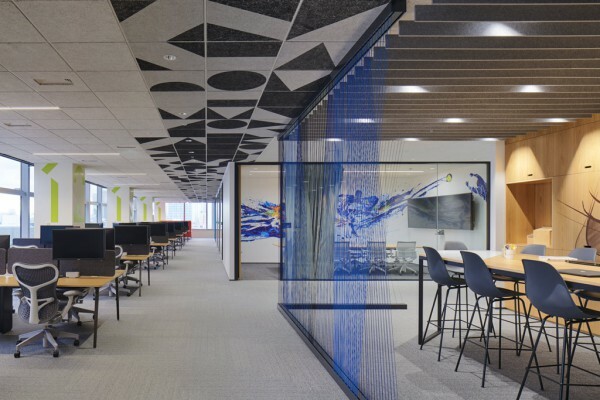 "Team Home" is partitioned with colorful yarn-like partitions, and even if the same components (chairs, tables, storage) can be found throughout the space, these present variations in type and height, etc., allowing different working methods for different teams. 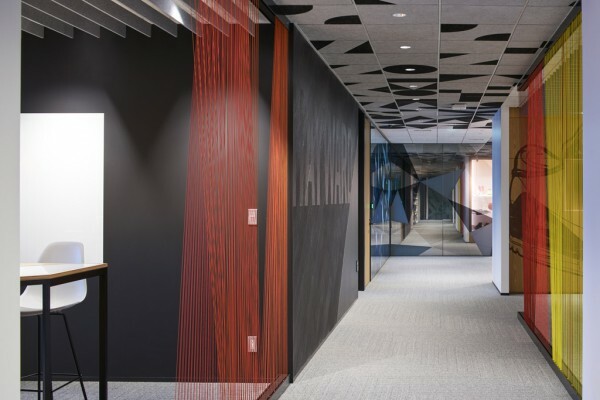 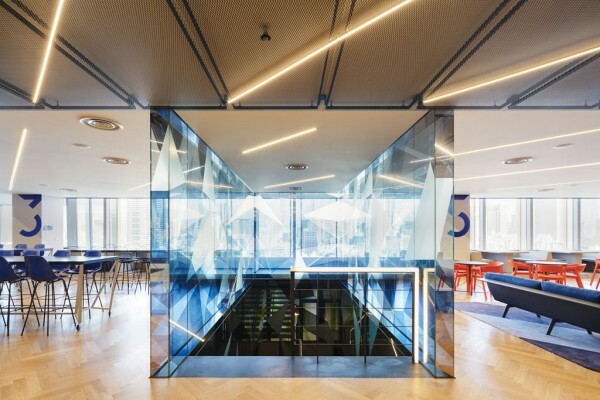 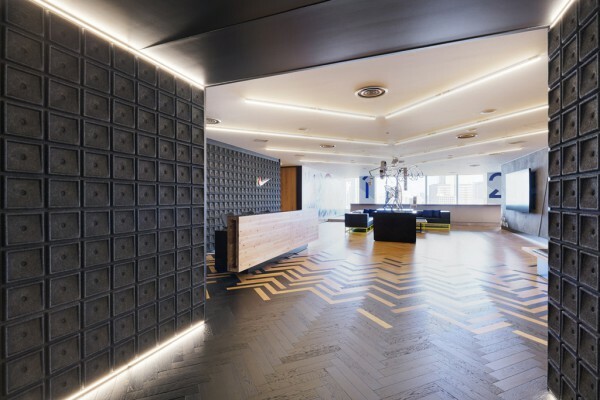 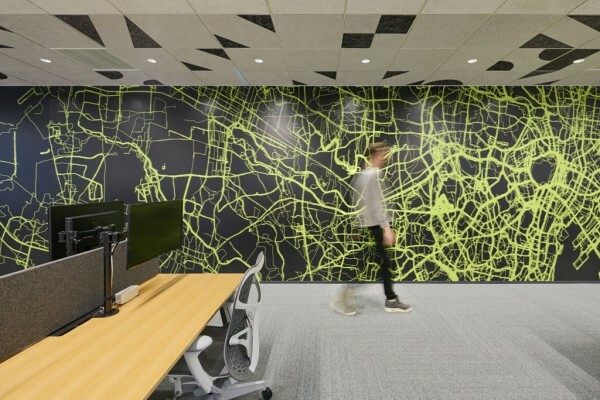 A main line of flow was created among the expansive office space by establishing a passage known as the "Highway" between the private room and office areas. 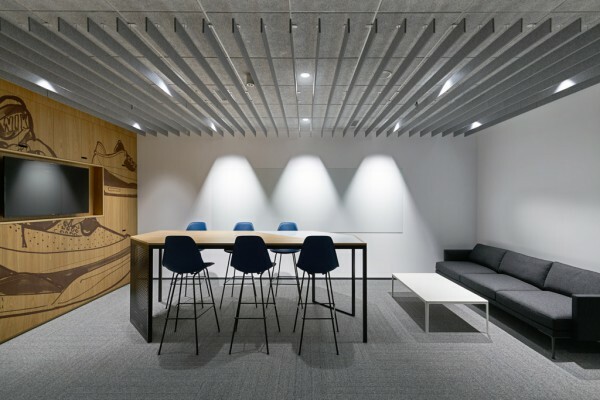 Also, patterned highlights were applied to cemented excelsior boards on the ceiling, thereby acting as guideposts in this freely accessible office environment. 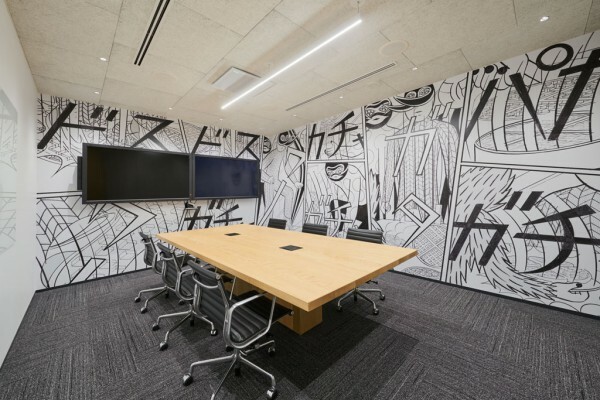 In addition to large and small conference rooms, workers can freely choose their place of work according to their intended use. 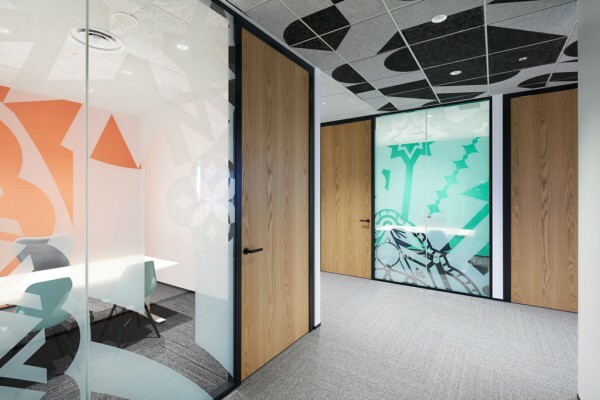 For example, they can use the "Phone Booth" for a telephone conference, the "Focus Room" for small meeting sessions, or the personal booths for individual work. 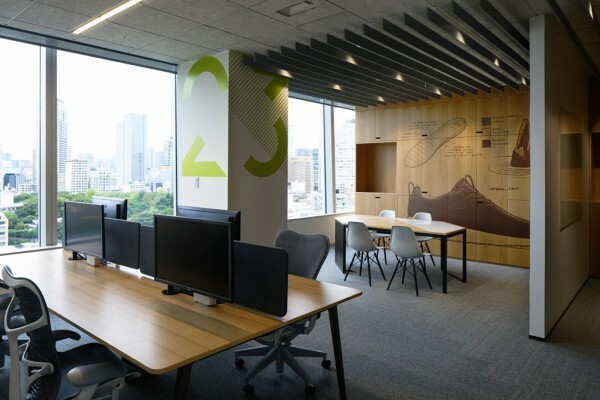 Seizing on the opportunity offered by the company's relocation to the center of Tokyo, we sought to create an office space where employees can spend their time on the job more freely and comfortably while finding enjoyment in the process as they face major changes in how their work is conducted.